Must be a mistake that somehow slipped through. 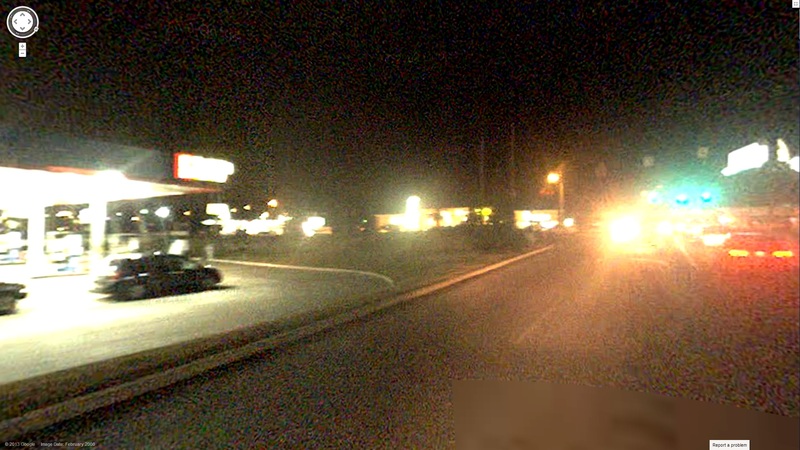 I don’t doubt that the street view cars take pictures at night from time – on the way back from an assignment for example – but they most likely have a system in place that’s supposed to remove them before adding them in the live google maps. Cool catch! Great one CK. Beautiful too. Goulburn, a country town in NSW Australia, has night view on one side of the road and day view on the other. Look at 100 Lagoon Street, Goulburn and it’s daytime, then move across the road (or enter 101 Lagoon Street, Goulburn) and it’s nighttime. New York near Bryant Park and it looks like everyone is dressed up as Santa. Navajo Trail, near Hesperus, Colorado. This one was taken all the way back in 2008, so it looks like you’re entering the Matrix. Rune, I like that one for a few reasons. First it is in my home state of Colorado. Second that it is a single location, go either way down the road and it is back to daylight. Lastly, that matrix effect tho! Philadelphia, Callowhill St. in the Northern Liberties neighborhood. just found one… Kimwell Drive, Winston Salem NC. Crazy!! Good one. That whole neighborhood seems to have been driven at night. It stays night at least for several blocks–can’t see anything! film noir street view–????? ?